If your test result is a “FAIL”, there is a high probability your sample contains sufficient toxic chemicals (based on the panel we test for below) that would exceed the US Military Exposure Guideline for Safety, as defined below. WHAT DO I DO IF MY TEST RESULT IS A “FAIL”? 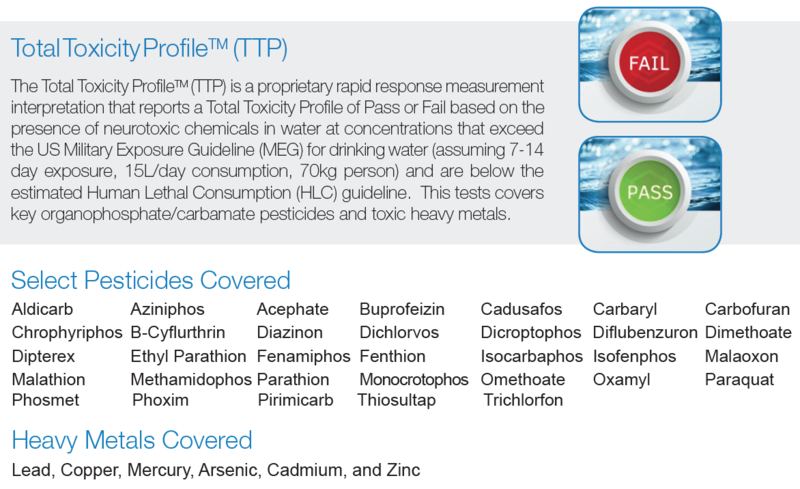 If your results failed, this means the sample tested contains one of more of the above toxic chemicals above the exposure limit for safety. If you are using the Digital AquaDx Analyzer, that datapoint is now stored and will be used to provide alerts to other residents in your local community, including your municipality, that water tested near your location might be safe or unsafe to drink. If you are concerned about the safety of your water, please feel free to call us at (800) 814-4550, send us an Email at info@mydxlife.com, or fill out the form below and a member of our staff will contact you to provide you with options in your area to secure clean drinking water or water treatment. Thank you for choosing MyDx to help you Trust & Verify what you eat, drink or inhale.